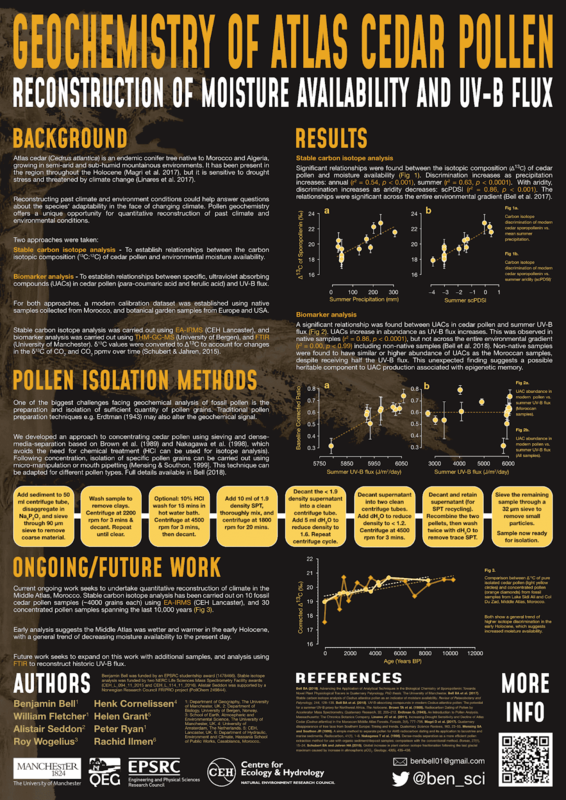 If you're attending this years EPPC 2018 - please come along and check out my poster presentation on pollen geochemistry of Atlas cedar, and how it can be used to tell us about the climate and environment. If you can't make the conference, or would like to know more details about this work, read on! First, a little background information. Atlas cedar (Cedrus atlantica) is an endemic conifer tree found growing across Morocco in the Rif Mountains, Middle Atlas, and parts of the High Atlas. It is also found in Algeria in the Tell Atlas, and Aures Mountains. Cedar has been in the region for thousands of years, but it is threated by climate change, extreme drought and human activity - particularly logging and grazing. Because of the tree's longevity, and because it is the only species of Cedrus growing in the region, it is an ideal species to study to learn about the environment and climate of the past. We can be sure that analysis of fossil cedar pollen (from lake sediment and peat sediment cores) in the region comes from Atlas cedar. Unlike for example, pine, where the pollen may be from several different pine species (although analysis of pine geochemistry can identify pollen to the species' level). Cedar is also an early autumn (fall) pollinating species, which means the pollen develops during the summer months, and its geochemistry is influenced by summer conditions. In a previous blog post, I discussed pollen geochemistry in relation to how it is used to tell us about solar UV-B levels. Check out the post to learn more. This blog post will cover stable isotope analysis of Atlas cedar pollen, ongoing work looking at fossil cedar pollen, and describe a method for isolating cedar pollen without using traditional chemical treatments.